How Will Car2Go’s Service Changes Affect Denver Traffic? 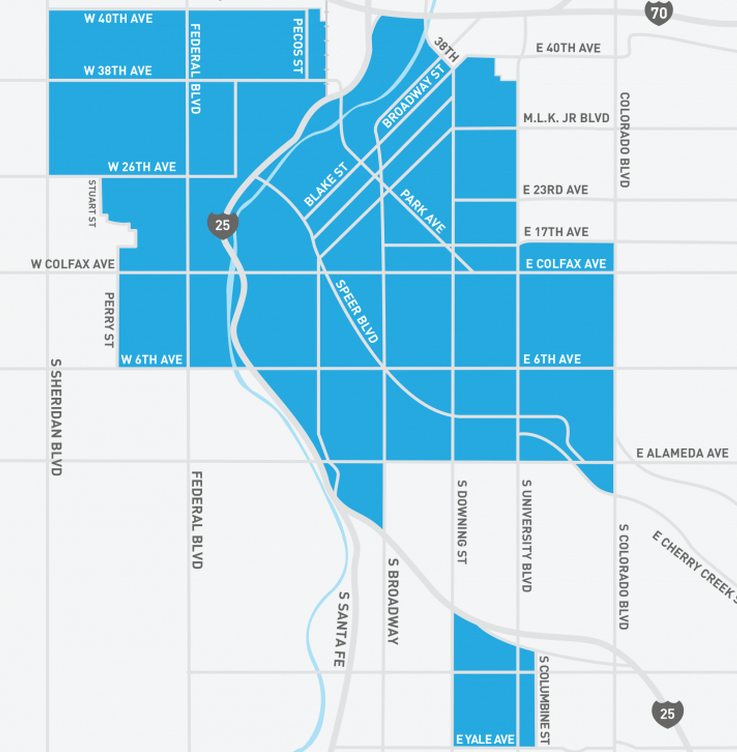 The tiny smart cars in Car2Go’s fleet sit unused much longer in neighborhoods outside of Denver’s urban core than inside it, so the car-share company will shrink its “home area” — the places where car2go drivers can pick up and drop off the vehicles — to exclude neighborhoods like Athmar Park, Wash Park, and Park Hill. The change begins September 14. The company says it can serve more members more often by concentrating its fleet closer to downtown, where more of its members live, work, and visit. It was a business decision for the private company, but what does it mean for Denver’s transportation system? From a public policy standpoint, car-sharing should be a tool that helps residents forgo car ownership. Maybe that means turning a two-car household into a one-car household, like Mark Kristensson of University Hills might have done. “We certainly are not frequent users of Car2Go, using them only one to two times per month, but we have considered giving up one of our two cars because of their coverage,” Kristensson said. “That clearly is not going to happen now.” According to a survey [PDF] of Denver’s car-sharing members (including people who use other services than Car2Go), 25 percent gave up a vehicle after joining. That’s a sign that car-share is achieving the desired goal here, but it’s not the whole story. Overall, do car-share members drive more or less because of the service? For every household that gives up a car thanks to car-share, there may be one that simply drives more with the addition of the car-share option. According to the same survey, it looks like car-share in Denver is a net traffic reducer. (Again, these results are for all car-share services, not just Car2Go.) Far and away, the most significant travel behavior change people reported was a drop in solo driving. There was also a significant increase in walking. The effect on transit ridership was not large, with a car-share members saying they ride transit less slightly outnumbering members who said they ride it more. However, with Car2Go now concentrating service in the core of the city, where transit service is best and biking is easiest, it may shift more trips away from these modes. The effect of car-sharing on urban transportation is still not very well understood, and there’s not enough data available to assess the impact of Car2Go’s service changes. But it does seem like the new zone will make Car2Go more appealing for Denverites who are most likely to switch from transit, and less available for Denverites who are more likely to reduce their private car trips. Hypothetically, the city could decide to make the most transit-rich parts of the city off-limits to Car2Go, but Denver doesn’t regulate car-share services much beyond charging a fee for the ability to have their cars parked in metered spaced.